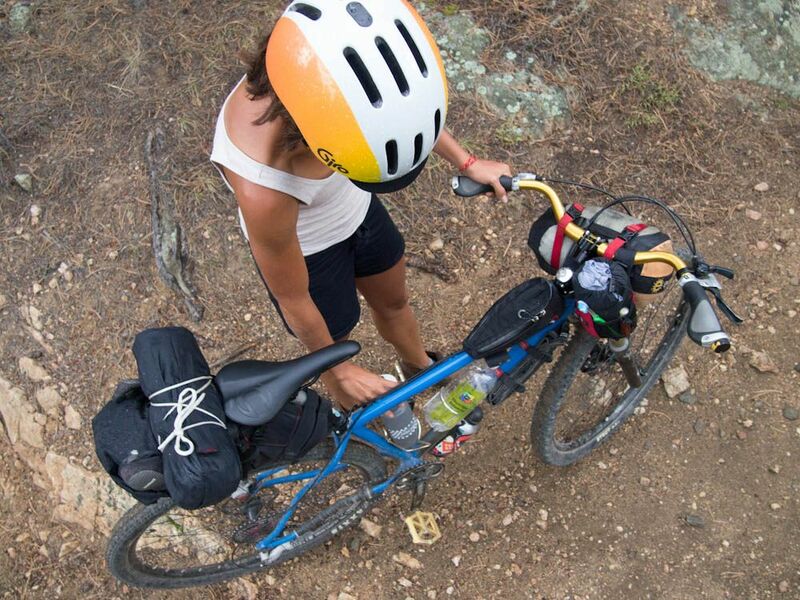 Panniers have the advantage of being easier to pack and easier to remove from the bike. There is some tradeoff in bike-packing luggage. Agreed. While I like looking at all the new frame bag designs the reality is that two small Ortliebs work just as well if not easier. Seems like all the frame bags put the weight up high which seems like it would impact handling. I did a 9 day tour with all my gear in my panniers and a small stuff sack on the rack. Panniers certainly have the benefit of convenience. Baskets are a breeze. Most panniers are optimized for convenience in urban use, at the expense of attachment systems that are durable and secure. Ortlieb panniers use a rather flimsy lower retention hook, which allows the bag to move in transit. On rough roads, they make a lot of noise and can fall off. Although unlikely, I've seen a wheel damaged by an airborne pannier. While Ortlieb panniers (and others) have proven themselves, for some kinds of riding there are better approaches. For paved tours, panniers are a sensible solution. The last time I used Ortlieb panniers I cinched a nylon gear strap around the belly of the bag to limit noise and motion. For rough roads, for a narrower profile (clearance on trails and aerodynamics), and for reduced weight, other methods excel. I think having the load low to the ground is less important than having a minimal load overall. Framebags keep weight low and center, and contain the load securely and quietly. Of course, we're lucky to have many options that work well. One day a couple years ago I was walking back from the grocery with my old Kelty external frame backpack stuffed with my favorite healthy foods (pizza and beer) and thinking about bicycles. I found myself wondering why we add a frame (racks) to a frame (the bike) By the time I had reached home I had invented the concept of what I would call Bikepacking. I cracked open a beer and googled the term just to make sure it wasn't used by someone else first. One of these days I will come up with an idea that several thousand people haven't beat me to. So...my latest is a helium balloon with a wicker basket towed behind the bicycle. I will call it the AirBob and I'm not even going to check on that term, I am that confidant of success. Guest posts of this caliber are a wonderful enhancement to your site. More, please! TJ- Thanks for the thoughtful advancements in trailer design. A 13lb Bob is a boat anchor, so your Wicker Helium trailer will be an improvement for sure. As we lighten our loads, neither the weight of rack and panniers or "proper" touring bikes are necessary. 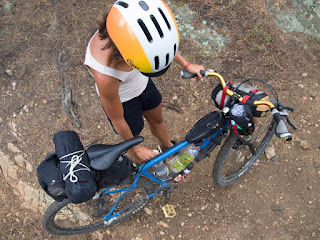 Lael's well-equipped 35lb Surly LHT (with rack, fenders, and Schwalbe tires) is tough to swallow with only a 15-20 lb load. She suggests that modern panniers are like clip-on ties. A real tie fits better, moves with you and won't fall off. I've ridden many miles with a variety of luggage arrangements. 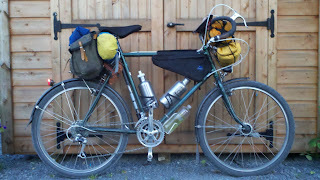 I've used a large saddlebag (similar to a Carradice) with Rivendell's silver hoop support, I've used (and still used) a medium Berthoud handlebar bag mounted to a small front rack, and I've used Arkel panniers on Surly front and rear racks. For a light load, and for my particular bikes, the Berthoud bag wins easily. The saddlebag was okay (same bike) but for some reason the bike rode a bit oddly with it mounted. The panniers are overkill for a load small enough for the Berthoud bag, especially with the massive Surly racks, but they work great for heavier loads. However, on a narrow singletrack I can definitely see how low-mounted panniers could be a problem. Mine have never been particularly noisy, though, and the bike's handling doesn't seem to be greatly affected with panniers unless I have a really heavy load. I also used a large trunk bag mounted on a rear rack for several years, and while not bad, it wasn't really as good as any of the other options, in my opinion. I've never tried a frame bag, mostly because I'm satisfied with my current setup, but also because, to clear my water bottle it looks like I wouldn't have much room left for the bag. So I'd have to use a small bag which probably couldn't hold enough for all my needs. Good luck with your balloon TJ but I'm afraid Air Bob has been around for a bit. Gary Fisher used to have a BMX bike wit that name. Blogan- It's always fun to see the luggage combinations that result from much experience. I suspect many of us start with a load of panniers, and adapt our systems from there. It was also lots of experimenting with front and rear panniers, handlebar bags, saddlebags, and frame bags before I came up with the current combination. Excepting an expedition into vast remote places, I'm not planning on using panniers anytime soon. 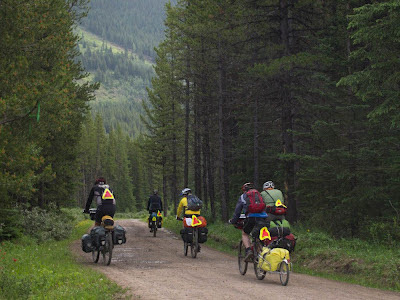 I ride as much off-pavement as possible, and panniers simply aren't ideal, although they are not unworkable As you say, the Arkels have a very secure attachment. My cycling companion has used the Jandd Hurricane panniers (the smaller model) and notes that the attachment is also very secure and quiet. I do not notice any adverse handling with the saddlebag, and none of the typical swaying. I attach several drybags between the saddlebag, seat post and rack/fender, which stabilizes the entire load. I used a gigantic Ostrich handlebar bag for a trip to MX several years ago. While I Iiked the capacity and the ability to organize, I found it to be noisy as it bounced on rough roads. Soft attachments such as with saddlebags and frame bags, or even drybags strapped to the handlebars satisfy my desire for a quiet bike on rough roads. However, I miss the convenient map window of a proper handlebar bag. Somehow, I've carried very few maps all summer. Framebags do complicate the storage of water. Bladders are an efficient use of space and can be stored within a framebag. As well, I really like the attachments now seen on Salsa and Surly forks for H2O bottles. King Cage, of Durango, CO, make a top cap mount for water bottles to be used with 1 1/8 in. threadless systems. Very funny. I had never heard of that model. Sorry TJ, but your great idea will require a new name. What handlebar is that on the bike the nice lady is riding? Richie- That is the On-One Mary, available in 25.4 and 31.8 clamp diameters in Al, and 25.4 in Cro-Mo. It also comes in a variety of colors. In particular, the nice lady likes gold. I enjoy the variety of handlebar dimensions that VO manufactures. I personally prefer the Tourist (57cm wide, 60deg sweep) for all-around riding including both urban rides and dirt roads, but a bar with less sweep and more width satisfies the need for control while riding trails or with a load. The Mary is about 65cm wide with a 35-40deg sweep, and 37mm rise. It's just about perfect, and the nice lady revels in all-day comfort. Same difference frankly, I have a large saddle bag and frame bag, stuff I don't need to take out during a tour go in saddle bag, stuff I need to in frame bag. It Take the same amount of time to load and unload, I rode 3,000km with a fixed wheel bicycle, whether my friend have a conventional pair of rear panniers. 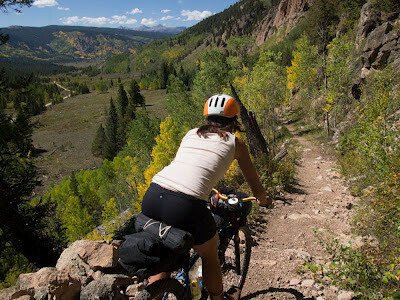 If anything, bikepacking is easier and quicker, otherwise hiker wouldn't stick to their trusty backpack in favour for sherpa.